A few weeks ago I arranged a lunch with @MathildeCuisine for today – how lucky were we with the weather! Myself and @foodiestgeorge went along to meet Mathilde at Towpath, a new venture from writer Lori De Mori and photographer Jason Lowe on a less glamerous stretch of Regents Canal. Upon arrival, I was unsurprised to see mismached furniture and crowd of ‘cool’ punters that looked like artists – most probably residents or workers in a nearby art gallery. I was also unsurprised to see that the bank was full to the brim on what seemed like the hottest day of the year so far. 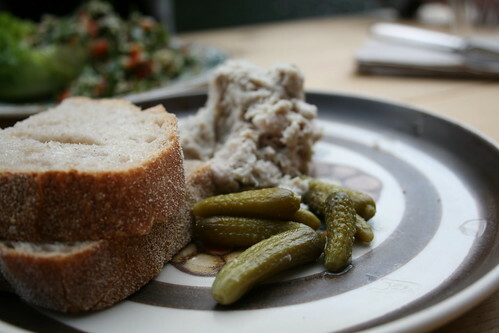 Pork Rillette, originally uploaded by Food For Think. 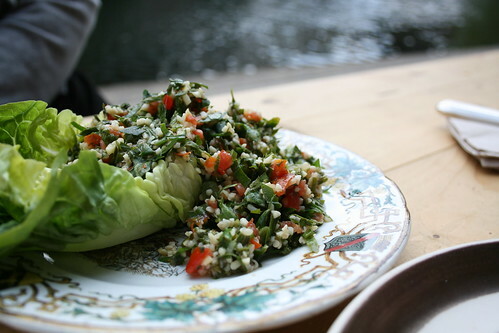 Tabouleh, originally uploaded by Food For Think. 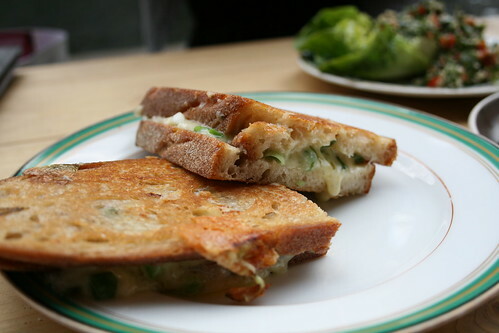 Cheese and spring onion toastie, originally uploaded by Food For Think. 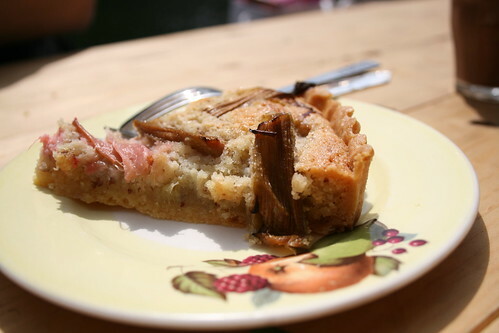 Rhubarb and almond tart, originally uploaded by Food For Think. 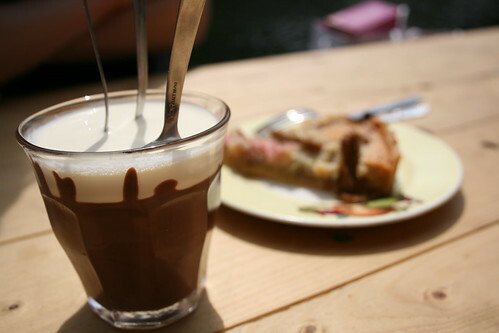 Chocolate pot with cream, originally uploaded by Food For Think. One last bit of fun before we left – young children canooing along the canal and fighting to overtake each other right infront of us (hello – why wasn’t that on my sports syllabus at school?) and lazy barges chugging past. On our departure, we spied the waitress carrying the sandwiches from a house around the corner – I’m guessing it is the house of Lori and Jason – looked like a very nice one too. Looks like a lovely lunch – and you certainly had the weather for it 🙂 Gorgeous pictures! Thank you very much 🙂 I know – don’t think we could have been any more lucky with the weather. It looks like a lovely afternoon and a decent lunch; especially that chocolate pot! It’s worth the visit if only for the chocolate pot with cream. We had a hot chocolate afterward and it didn’t cut it because the chocolate pot was so nice and rich. Lovely location for a sunny day too.